"Koyasan" redirects here. For the novel by Darren Shan, see Koyasan (novel). Mount Kōya (高野山, Kōya-san) is the common name of a huge temple settlement in Wakayama Prefecture to the south of Osaka. In the strict sense, Kōya-san is the so-called "mountain name" sangō (山号) of the Kongōbu-Temple (金剛峯寺, Kongōbu-ji), the ecclesiastical headquarters of the "Koyasan Shingon School". Kongōbu-ji (金剛峯寺), the head temple of the Kōyasan Shingon Buddhism. Located roughly in the middle of the sanctuary, Kongobuji is colloquially known as "Kōyasan-Issan", literally meaning "the mountain of Kōya". The temple was built by the warlord Hideyoshi Toyotomi for the mass of his mother when she died. Originally named Seiganji, it was later renamed Kongobuji in the Meiji Era. Danjogaran (壇上伽藍), at the heartland of the Mt. Kōya settlement. Garan is a name for an area that has buildings, a main hall, several pagodas, a scripture storage, a bell tower, a lecture hall, and other halls dedicated to important deities. Here we also find a shrine dedicated to the Shintō-gods of that mountain area and in front of it an assembly hall (Sannō-dō). Danjō Garan is one of the two sacred spots around the Mount Kōya. Konpon Daitō (根本大塔), the "Basic Great Pagoda" that according to Shingon Buddhism doctrine represents the central point of a mandala covering all of Japan. Standing at 48.5 m tall and situated right in the middle of Koyasan, this pagoda was built as a seminary for the esoteric practices of Shingon Buddhism. This pagoda and the Okunoin Temple form a large sanctuary. Daimon (大門), the main gate for Mount Kōya. This mammoth gate stands as the main entrance to Kōyasan. It is flanked on each side by Kongo warriors who guard the mountain. The view from the front of the gate is magnificent and, on a clear day, can reach as far as the Seto Inland Sea. Tokugawa Family Tomb. This mausoleum was built by the third shogun Iemitsu Tokugawa. It took ten years to build and is architecturally representative of the Edo Period. First Edo shogun Ieyasu is enshrined on the right and the second shogun Hidetada on the left. The Structure is elaborately decorated with ample use of carvings and brass fittings. In 2004, UNESCO designated Mt. 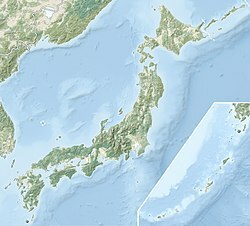 Kōya, along with two other locations on the Kii Peninsula, Yoshino and Omine; and Kumano Sanzan, as World Heritage Sites "Sacred Sites and Pilgrimage Routes in the Kii Mountain Range". Koya-san is accessible primarily by the Nankai Electric Railway from Namba Station (in Osaka) to Gokurakubashi Station at the base of the mountain. A cable car from Gokurakubashi ("Paradise Bridge") then whisks visitors to the top in 5 minutes. The entire trip takes about 1.5 hours on an express train or 2 hours by non-express. Local automobile traffic can be very heavy on weekends until well into the evening. On weekdays, however, the mountain offers a pleasant drive followed by the excitement upon reaching the monasteries lining the summit. Many Buddhist monasteries on the mountain function as hotels for visitors providing traditional accommodation with an evening meal and breakfast. Guest are also invited to participate in the morning services. Wikimedia Commons has media related to Koyasan. Wikimedia Commons has media related to Okunoin. ^ As there are many temples with identical names, Chinese and Japanese temples are traditionally given additional "mountain names". These are no geographical designations. There is no mountain called Kōya-san in Japan. ^ "ポメラニアンに適したフード". www.shukubo.jp. Retrieved 2019-02-25. ^ Garan is an abbreviation of sōgyaranma (僧伽藍摩), skr. saMghaaraama सँघाराम), meaning "garden of monks". In Japan it was later used for central areas of big temples such as Kōya-san. ^ "About Mount Koya Danjo Garan - Mount Koya Travel Guide | Planetyze". Planetyze. Retrieved 2017-11-07. ^ "About Daimon - Mount Koya Travel Guide | Planetyze". Planetyze. Retrieved 2017-11-07. ^ Hiragana Times, "Koyasan- A Sacred Tranquility", Volume #294, April 2011, pp. 34-37. Wikivoyage has a travel guide for Mount_Koya. Nicoloff, Philip L. (2008). Sacred Koyasan: A pilgrimage to the Mountain Temple of Saint Kōbō Daishi and the Great Sun Buddha. State University of New York Press. ISBN 978-0-7914-7259-0.